Sentinel, the HashiCorp framework for policy as code management, is built to be embedded in existing software to enable fine-grained, logic-based policy decisions. A policy describes under what circumstances certain behaviors are allowed. Sentinel is embedded into the Enterprise version of each of the HashiCorp products and was first introduced at HashiConf. We will look at the details of a specific Sentinel policy in this blog; Sentinel basics are covered in: Announcing Sentinel, HashiCorp’s Policy as Code Framework, Why Policy as Code, and Terraform Enterprise: Applying policy as code to infrastructure provisioning. Our example company falls under regulation regarding the sovereignty of their data and they are legally bound to ensure that no data ever leaves the country. Since AWS regions often span multiple countries we need a slightly more complex policy than the one used to restrict region in our previous post. Let’s take a look at how we can use Sentinel to ensure that we always adhere to this regulation. This example demonstrates a Sentinel policy which ensures aws_instance is only placed in the allowed availability zones. In cases where the policy check fails, Terraform Enterprise will not allow the terraform apply to occur. A logged error will be reported and indicate to the user they are violating a hard-mandatory (cannot override) policy, and the user cannot proceed with their actions until the value has been corrected. Below is the example policy for this scenario. This code must be in a public git repo or other compatible source control management solution for Terraform Enterprise. In this section, create a new workspace and link it to your terraform-demo repository. 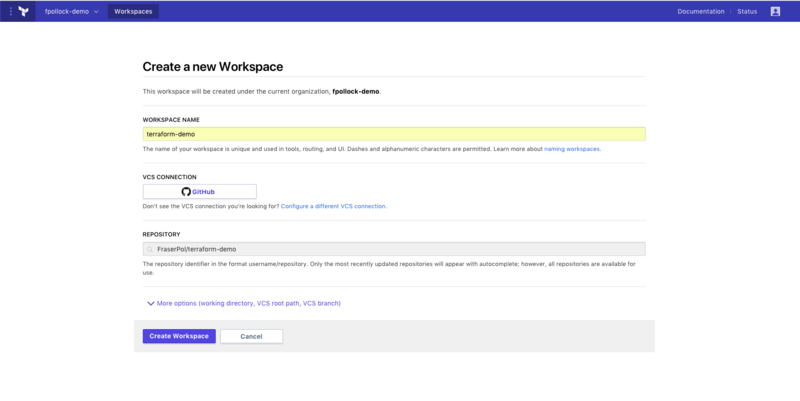 In the Terraform Enterprise UI, navigate to create a new workspace view at https://atlas.hashicorp.com/app/:organization/workspaces/new in your browser, where :organization is the name of the organization you will create the workspace in. 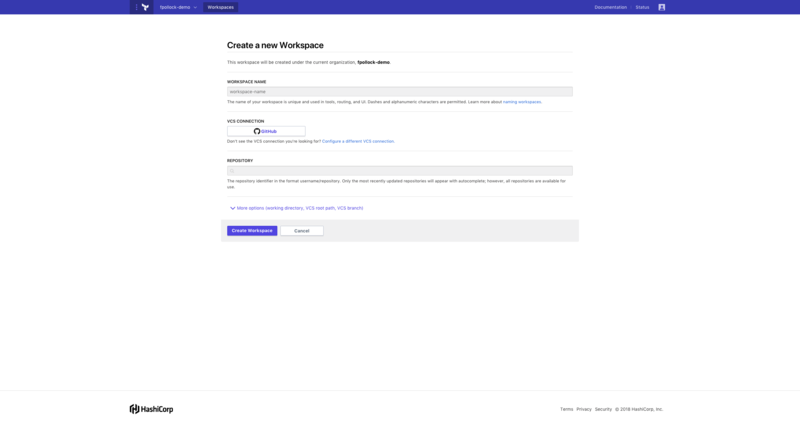 Enter terraform-demo as the workspace name and select the terraform-demo GitHub repository you forked when completing the prerequisite steps or the repo you created. Click Create the workspace. 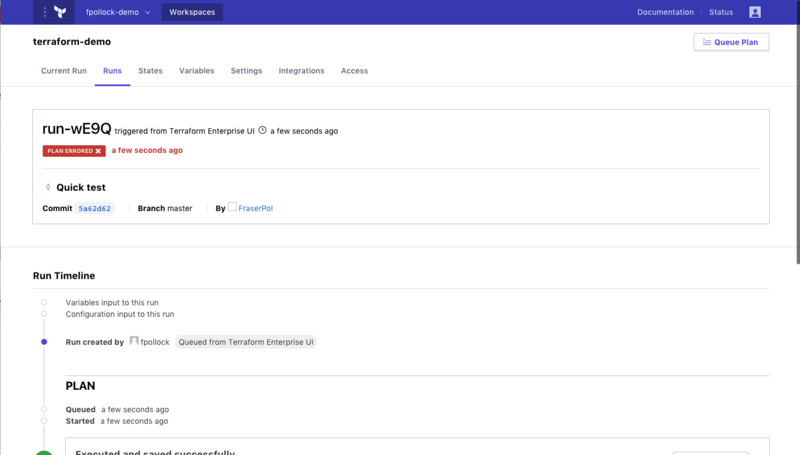 Navigate to https://atlas.hashicorp.com/app/:organization/terraform-demo/variables in your browser, where :organization is the name of the organization you created the workspace in. Add AWS_ACCESS_KEY_ID, AWS_SECRET_ACCESS_KEY variables with values that provide you access to AWS and the Save. If you were using the repo from the prerequisites, your variable setup will look similar to this to cause an intentional failure. The availibility_zone variable is the value we are checking. In this section a new policy will be created. 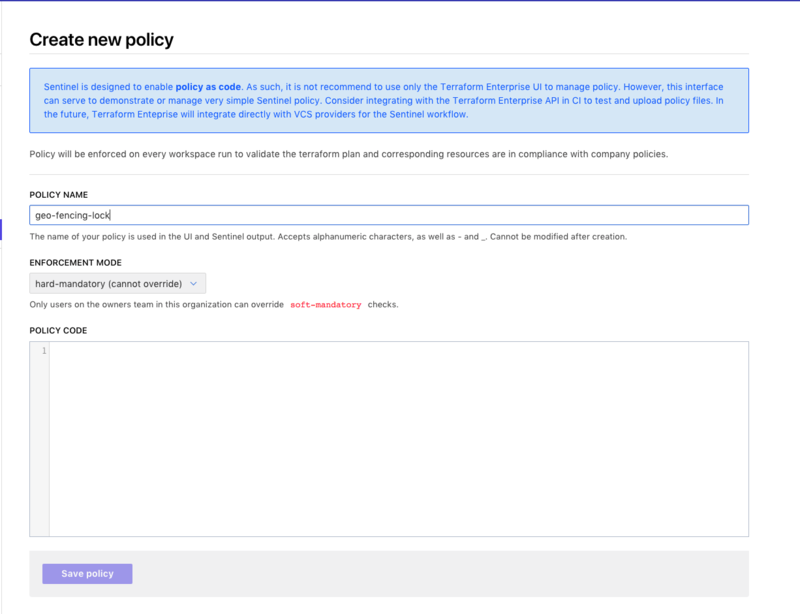 Navigate to Create new policy view at https://atlas.hashicorp.com/app/:organization/settings/policies in your browser, where :organization is the name of the organization you will configure the policy for. 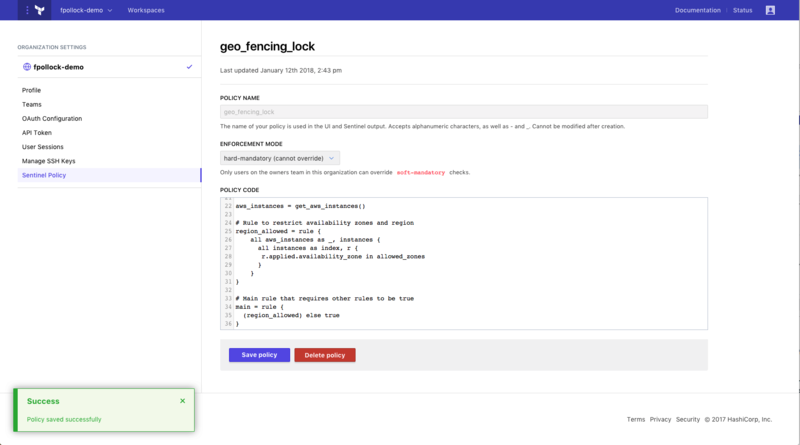 Enter geo_fencing_lock as the policy name, set the enforcement mode to hard mandatory and copy the below policy into the policy code text area. Save the policy. In this section we will see the policy enforced during a Terraform run. The policy is saved for the organization and it will be used for all future Terraform runs. Navigate to https://atlas.hashicorp.com/app/:organization/terraform-demo/runs in your browser, where :organization is the name of the organization. Queue a plan. With the Terraform plan complete, review the plan and policy output by navigating to https://atlas.hashicorp.com/app/:organization/terraform-demo/latest in your browser, where :organization is the name of the organization. Click the “View Plan” and “View Check” buttons to view the log of the plan and policy check stages. As demonstrated above, the geo-fencing (preventing infrastructure being provisioned to a non-allowed availability zone) was successful. With the intentional failure on the region us-west-1b we are unable to provision infrastructure to any availability zone not specifically identified. to false. This false was not due to an undefined value or runtime error. FALSE - geo_fencing_lock.sentinel:37:1 - Rule "main"
As this policy is hard-mandatory (cannot-override) it is impossible for operators to circumvent. By design we have now locked our infrastructure into a specified regional zone. If you wish to validate this you can update your region back to “us-east-1b” and re-run the plan. behavior is allowed by Sentinel policies. TRUE - geo_fencing_lock.sentinel:37:1 - Rule "main"
TRUE - geo_fencing_lock.sentinel:28:1 - Rule "region_allowed"
Click “Confirm & Apply” to complete the Terraform run and provision infrastructure in AWS. Sentinel policy as code management is an important part of infrastructure automation and removes the need for manual policy enforcement and associated ticketing queues. For those already using Terraform Enterprise try using the above example. If you would like to sign-up for a trial or to learn more about Terraform Enterprise, visit https://www.hashicorp.com/products/terraform.